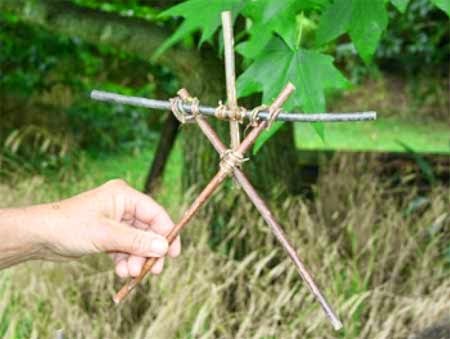 Ever wanted to make your own "Blair Witch" Cross? Well now you can. To start, all you need are a 6 to 8 inch square cloth. 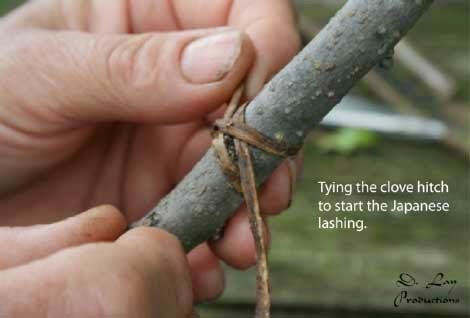 You’ll need a material to make lashings, or use hot gun glue if you are “knot” challenged and, you’ll need two sticks: One with a fork and one straight. The forked stick should be between 8 to 12” long, and the straight equally so. “Straight” is a relative term here; a little crooked makes it scarier. 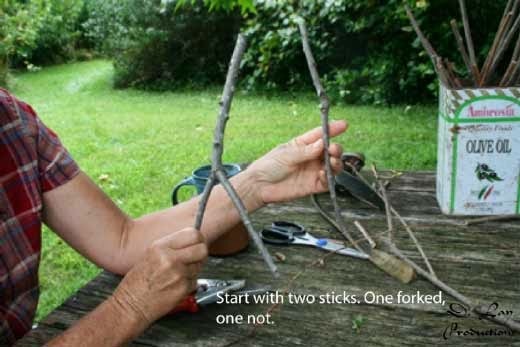 First, you are going to lash or tack the sticks parallel to each other, the straight stick about one to two inches down from the top of the forked stick. To learn about tying a lashing click HERE. 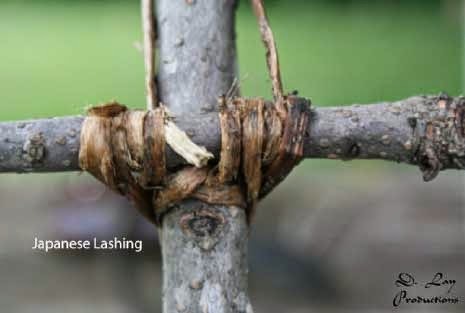 Start the lashing with a clove hitch and then cross the “arms” stick perpendicular to the “body” and tie the lashing. 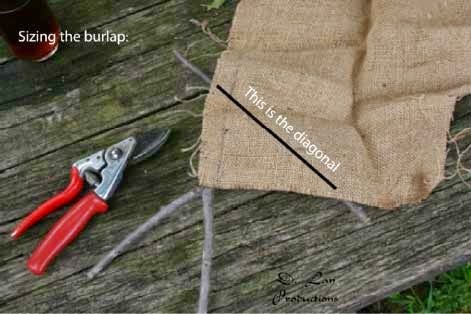 Size the burlap: Set one corner at the fork, and measure the diagonal along the arm. 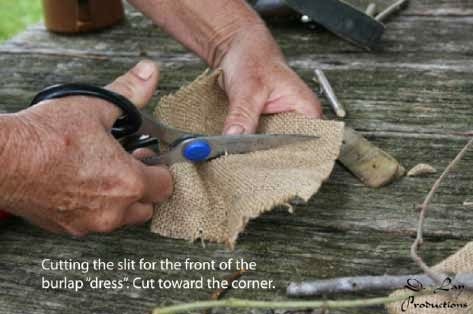 Once that is done, take the cloth and fold it diagonally from corner to corner. Repeat so the cloth is folded into quarters. 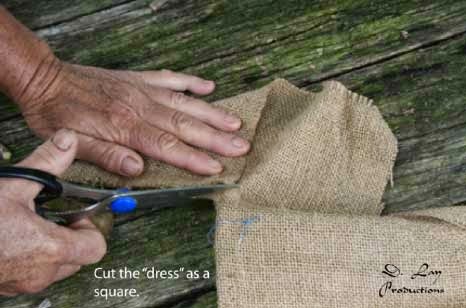 Using scissors, snip the apex of the triangle you’ve formed to make a small hole in the cloth, big enough to slip the “head” of the stick figure through, and unfold the cloth. Cut a slit toward one of the corners for the front of the “dress”. Now you’re ready to slip the cloth over the head of the stick. 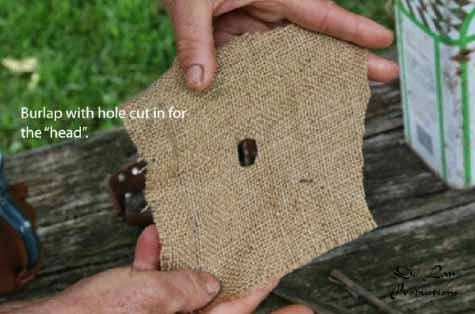 You’ll want to adjust the cloth so that the apex of the triangular cloth touches the split in the forked stick. 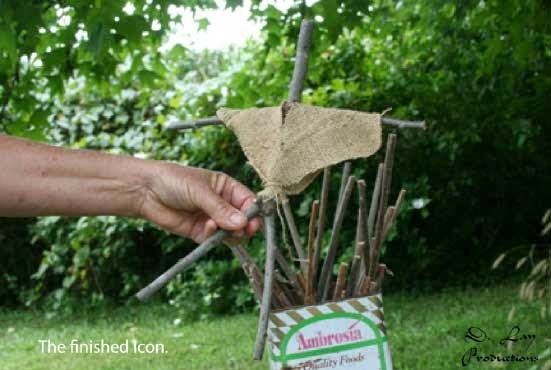 Tack this down by tying it with the root material or string, or simply tack it with hot gun glue. 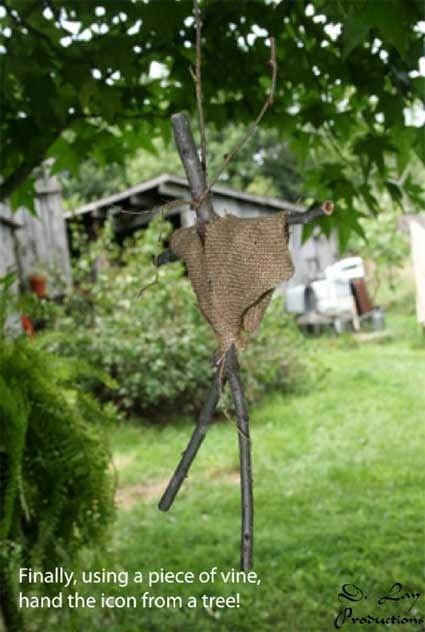 Now all you have to do is make a noose to hang the figure, and find an appropriate tree to hang it from! Two to make and “X”, one to tie to two tips of the “X”, and one to make the “head”. Tie the “X” a little above centre to give the “legs” a longer length. Tie the “head” to the cross piece and to the intercept of the “X”. 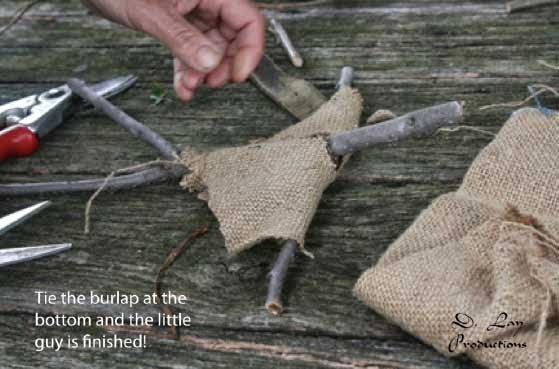 These don’t have any cloth, and you have to do a lot more tying.